Panoramic and particularly bright apartment of 80 sq. m. extending over two floors, created in the main section of the old barn. On the ground floor, living-room with fireplace, sofa-bed, terracotta floor and open-beamed ceiling. 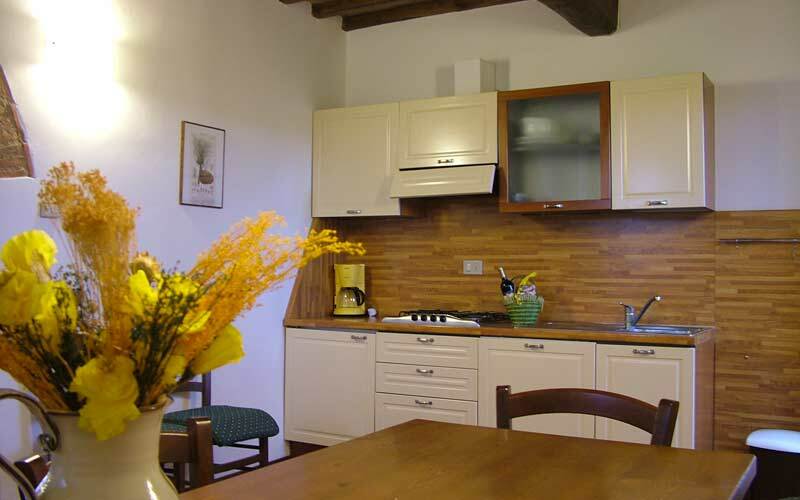 Dining and kitchen area fully equipped with dishwasher and small storeroom. Direct access to the garden from the dining-room. On the upper floor, two bedrooms with wrought iron beds and bathroom with shower. The main bedroom has three windows created in what was the grille wall of the barn, boasting superb panoramic views of the surrounding countryside and of San Gimignano. In the garden near the apartment private area with wooden table, chairs and parasol. In the common garden is also available for the guests a double barbeque, ping pong and a little children's playground. In the weekly price is included: electric power, water, gas, a set of bed linens a set of bath towels.